Income Tax department has recently launched new online income tax calculator for 2016-17. This online income tax calculator will help individual to calculate the tax before filing tax return. Income tax department has already notified new ITR forms for filing returns. It is also expected that E-filing to IT returns for individuals for AY 2016-17 will commence soon. 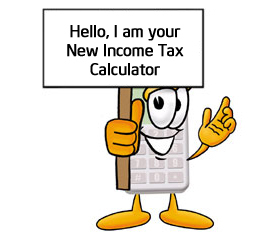 This new online calculator by Income tax will help you to calculate your tax liabilities. This online income tax calculator is hosted on Income tax website and designed for providing assistance to tax payer before filing income tax return. This tax calculator is updated by CBDT for every financial year. Current tax calculator is updated as per Union budget 2016-17 and allows you to calculate current year tax liability also. This online tax calculator provides facility for computing tax liability for assessment year starting from 2010-11 to 2016-17. This tax calculator also allows to calculate tax for HUF, Domestic Company, Foreign Company, firm, LLP, co-operative society etc. Option for selecting tax calculation for Male, female, senior citizen, super senior citizen. Tax calculation including income from House Property, Capital Gains and other sources. You can access income tax calculator by visiting Incometaxindia.gov.in -> tax tool section. Alternatively you can access this calculator by clicking here. In order to compute tax detail you need to select assessment year and provide relevant inputs about your income and other details. Once you are done this calculator will calculate your tax liability automatically. Under disclaimer it is mentioned that this tax calculator is only to enable public for quick and easy access to basic tax calculation. This tax calculator does not claim that it gives actual tax calculation in all circumstances. One can use this calculator as a reference for the calculation purpose only.